Anfan Inflatable Bumper ball-Exciting fun! 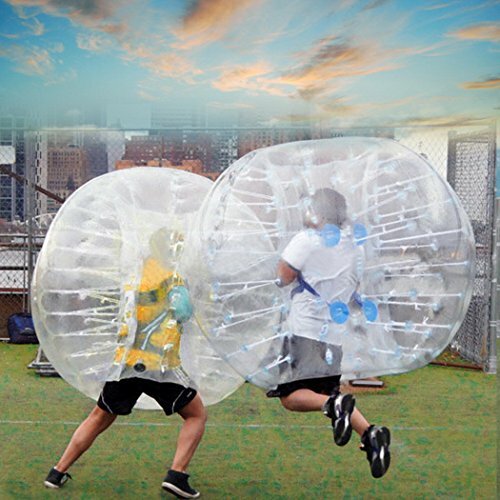 Bumper ball is the greatest fun you can enjoy with your family or friends.Strapping yourself into a giant inflatable ball, much like a wearable zorb ball, giving you the freedom to bounce, flip, roll over and bump, while playing games like Bubble Soccer, Bullrush and Last One Standing. •The inflatable bumper ball is for most of the ages, can be used for a wide range of. •Inflatable bumper ball material is plastic, relatively strong and durable, can be completely clean and reuse. •The bubble ball is made with great care and the best material. •Each bubble soccer ball is tested for 3 days before posted, to make sure it will works extremely well and meet the quality standard. ★Buy this item with confidence. If you have any issue with it, please contact us, and we will response and solve it within 24 hours. Your satisfaction is our top priority. ★AMUSEMENT PARK FUN ANYWHERE, ANYTIME - Inflatable, wearable Bumper Balls are the perfect activity for all ages at any recreational event. Enjoy family-friendly fun at the beach, park or in the backyard. ★GREAT FOR ALL AGES - Fantastic outdoor fun for kids and adults alike, wearable Bumper Balls can roll, tumble and bounce and are the basis for an endless variety of games. Encourages kids to get outside for fun, healthy activities that develop coordination, balance, and friendly competition. ★COMPACT & PORTABLE - Constructed of heavy duty, durable, odorless, PVC vinyl that is heat sealed and quality tested. Bumper Balls are collapsible and compact for transport and easily inflate in minutes. ★SAFE AND NON-TOXIC - Adult supervision is required while using these inflatable Zorb balls. Recommended for kids age 8 and up. Helmets and appropriate safety gear is recommended. ★GREAT VALUE & LIFETIME GUARANTEED - We are pleased to provide our latest products,designed specially to satisfy your needs. We assure you that our products are extremely cost-effective, user-friendly, eco-friendly in nature. Your satisfaction is our main priority.